Ireland’s first new catholic secondary school in thirty years has just completed its first week. Le Chéile Secondary School Tyrrelstown is the first catholic secondary school to open under the trust board system. The school is located in one of the most culturally and religiously diverse areas in the country. Other second level schools that have opened in Ireland in the last 30 years have either been multidenominational or non-denominational. Last Monday, 86 pupils started school in the west Dublin school and they will be taught be nine teachers, including the principal, two Special Needs Assistants, as well as a part-time secretary and a part-time care taker. The Department of Education allocated patronage to the Le Chéile catholic trust body, which comprises the schools of fourteen religious congregations, on the basis of parental preference. Two patrons actively canvassed parents to support their bid for patronage of the new school, Le Chéile and Educate Together. However, local parents predominantly favoured Le Chéile. Principal Aine Moran explained that Educate Together have a primary school in Tyrrelstown while there are three catholic primary schools in the catchment area in Ladyswell, St Patrick’s and St Luke’s. Roughly 10% of the students in the new school have Irish parents while the other 90% would have parents who have immigrated into Ireland. She said the school’s enrolment policy is not be based on religious affiliation as Le Chéile welcomes students from all faith traditions and none but on catchment area. The school is currently housed in temporary accommodation and therefore enrolment was kept to 86 students. Once the facilities are ready, that enrolment is expected to expand substantially. One new novel approach that the teaching staff has implemented is that every student attending Le Chéile Secondary School in Tyrrelstown will learn via an iPad not traditional books. The school has opted to teach and learn via a virtual learning platform. 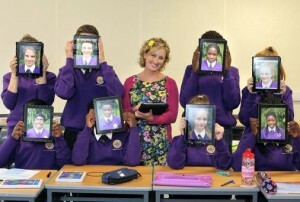 While some schools have begun to wean themselves off traditional books through Tablets and iPads, none have gone exclusively for a virtual learning platform according to Le Chéile Principal Aine Moran. Teachers at the Le Chéile secondary school create their own resources in a way that is most appropriate for the students they are teaching. They then upload this material on to a virtual learning platform called Schoology which the students can access from home and where they can submit their homework. Another factor in taking the virtual path was the outcome of tests on prospective students which showed that the majority of them were spatial and visual learners rather than verbal learners. All of the school’s nine teachers have already received comprehensive training in using an iPad and Schoology and the students are in the process of learning while the students’ parents will also receive some training too. Cost is a consideration but the Le Chéile principal explains that there are a number of options for parents. Those who wish to purchase an iPad4 can get one through the school for €375. However, if the student or parent/guardian has an iPad already the student can use that, though content will be wiped and a block is put on the iPad for any over 15 content. The cost of the Schoology for three years is €20 per year. “When you set this against the cost of books or even a book rental system it begins to make economic sense,” Aine Moran commented. “We envisage into the future, that prospective students will know we use iPads and may get one for Christmas or a birthday or confirmation and not have the expense of purchasing it specifically for school,” she said. As most notes are kept on the iPad students will also save on copybooks and the iPad has an inbuilt calculator. She said the school researched the options on Tablets extensively and choose the iPad because of how easy it is to use, its robustness and battery life.